Update March 2019: Read all about version 2.0 here. Do you bookmark a lot of webpages in WorkFlowy? Looking for an easy way to create links between distant WorkFlowy bullets? Clip To WorkFlowy to the rescue. With a single click, the webpage title and url get captured, formatted and copied to the clipboard for one easy paste into WorkFlowy. Paste into any browser, the Chrome app or the mobile apps. Clip To WorkFlowy comes in three flavors: Google Chrome Extension, bookmarklet, and the Workflow App for iOS. The webpage title becomes a WorkFlowy bullet item, and the url appears in the note. Optionally activate with a keyboard shortcut. Special formatting for intra-WorkFlowy links. No special permissions and no persistent memory footprint. Currently no support for selected text. NEW! 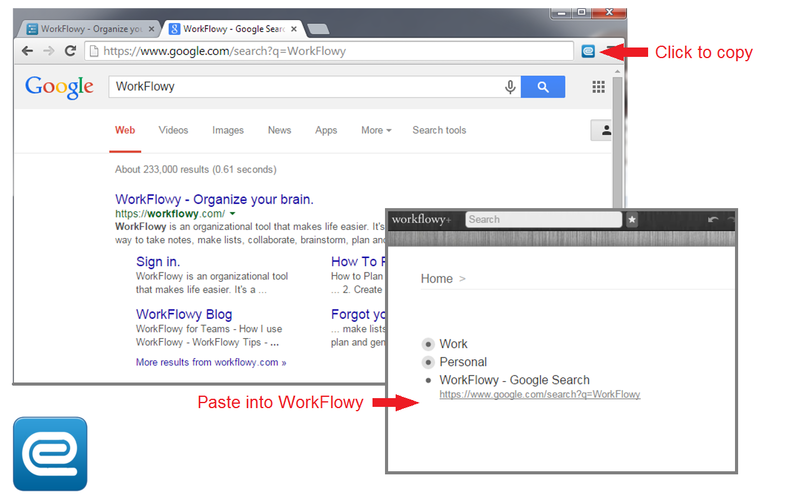 If you only use WorkFlowy in a Chrome browser tab try Clip To WorkFlowy BETA. It automatically goes to your first WorkFlowy tab. Supports selected text, which appears after the url in the WorkFlowy note. New in version 2.5! Automatically copies to the clipboard. No more prompt. You manually paste into a new WorkFlowy bullet. Works in Safari and apps that use the in-app Safari browser. Automatically copies and launches WorkFlowy in Safari so you can paste. Hey Rawbytz you should put these up on Github. I’d like to start a network of hacks — I’m working on an extension too — so these would compliment each other nicely. Awesome! Rob, you are absolutely right, and there’s a bullet somewhere in my outline telling me to do the same thing! Would love to hear what your extension is about. thanks so much, I’ve been dying for this functionality for ages! Do you think it would be hard to modify the bookmarklet to have it do the same for every tab in the current window? Unfortunately, it would be impossible. For security reasons, bookmarklets can only run on the active tab. As mentioned in your update, your extension (Clip to WorkFlowy) gives control over where you paste your clipping, without having to redefine your (WorkFlowy Clipper) inbox before heading to your web pages. My workflow remains the same – using your clipper to both clip internal WorkFlowy links as well as web pages – except on the rare occasion where I clearly need to clip multiple web pages to a specific list – that’s what the other extension does a good job at. Thanks Rawbytz! Thanks for Clip to Workflowy. I am using it constantly. I just discovered this blog and will subscribe. Workflowy is pretty good by itself, but you Rawbytz and the other contributors are making it even better. This is great, I had been using Trello for this functionality, but this is a better workflow. Does anyone know of an Android App for quickly clipping notes? Any chance to do it for opera? Yes in the meantime a found this addons. Btw. thx for answer!